common name for the Araceae, a plant family mainly composed of species of herbaceous terrestrial and epiphytic plants found in moist to wet habitats of the tropics and subtropics; some are native to temperate zones. Grass-like plant with cattail-type leaves and thin green “finger” sticking out from leaf stalk. The root is the part used, for indigestion (because it’s bitter), stomach, heartburn, spasms, colds, coughs, aphrodisiac. the hollow lower part of the shaft of a feather. 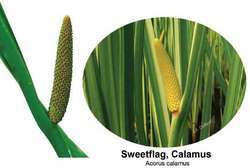 The calamus is partly beneath and partly above the skin. It lacks a vane and is usually semitransparent. Inside the calamus is a membranous formation. The calami of the flight feathers, which experience considerable stress during flight, are attached to the bones of the wings.